It’s that time of year again – training for the NYC Marathon – Fall 2011. Like a fine wine, running and training for a marathon is one in the same – complex, aggressive, well balanced, and perfectly paired. 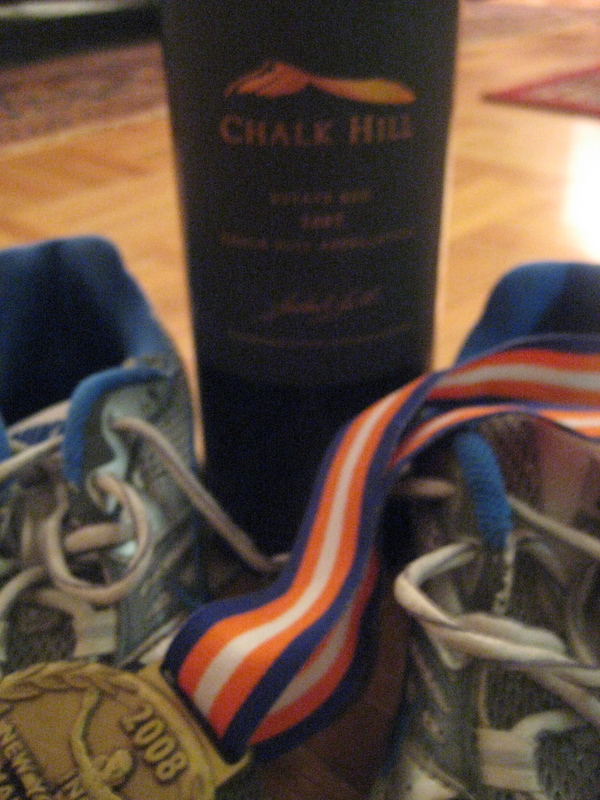 Training for a marathon is as strategic and process oriented as in wine making and fermenting. A good training partner and plan is just as a steak and a full bodied Pinot Noir are enjoyed together– the perfect match with the best end result. You get the picture. Along with wine, running is also a big passion of mine and believe it or not is a part of my training process. I try to pair my running schedule with a red/white, rose, and/or bubbly with the amount of miles I run and how my body is feeling to keep me motivated and ready for my next move.. Here’s how! Short Run (0-6 miles): Usually after a shorter run I feel frisky and light on my feet waiting for more and getting anxious and excited for the next day’s run. When I feel like this I usually crave a nice light Rose, Pinot Grigio, or sparkling wine to go with a light summer dinner either alone or with a few others. Medium Run (7-12 miles): Here is where your body starts to really feel you pounding on the pavement. You will need to rest a bit and recover with all the right sports drinks and go into a heavier dinner with wines with a little more kick and zest to pick you up when you may be in need of a recharge. I prefer a great Sauvignon Blanc, a Sancerre or even a nice spicy Shiraz paired with a protein filled dinner. After these long runs it’s great to enjoy your wine with a bunch of friends around you! They will support you and cheers to you every step of the way! Long run (13-19 miles): All runs need preparation however; these long runs specifically, need 110% of your mind, body and soul for a satisfied run and feeling. Marathon training endures a large amount of stress on the body so it is important that after you recharge with your ‘champion’ breakfast, to relax and enjoy a long dinner with lots of laughs and many “clink clinks” so you are able to associate your long runs with happiness and joy to stay motivated for the next. With dinner, after these long runs I usually enjoy a fruit filled Pinot Noir, Montepulciano, or Cabernet Sauvignon. They have lots of fruit and will replenish and put the warmth back into your body which in turn ensures you are relaxed. 20 mile run: Since I have been advised only to do one of these 20 miler’s while training to make sure you are tip top for the actual marathon (w/o pushing it), I usually enjoy an OJ w/ calcium and champagne filled Mimosa to take the edge off with a late brunch. Then with dinner would probably have a heartier wine like a Cabernet Sauvignon to again get that warmth back in my body and cheers to it almost being marathon day! Marathon – Post Marathon Celebration – Veuve Clicquot of course.. You deserve it! So there you have it. A few tips on how to incorporate a few squashed grapes and maybe even some antioxidants into you marathon training. It helps keep your eye on the finish and lets you feel fresh, excited and motivated while doing it! Happy running and wine drinking!